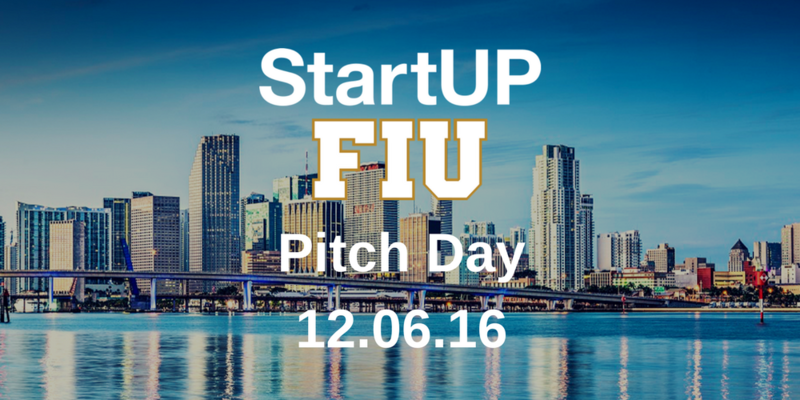 Entrepreneurs hit the mark with potential investors at StartUP FIU’s first Pitch Day. Let’s say you’re an entrepreneur and you have five minutes to pitch your idea to dozens of potential investors, an idea you may have been working on for a year or more. Go! 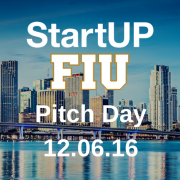 Entrepreneurs got to participate is this high-stakes situation at the first “Pitch Day” event presented by StartUP FIU, held December 2, 2016, at the Modesto Maidique campus of Florida International University (FIU). StartUP FIU is a collaborative initiative for FIU students, faculty and early-stage startup entrepreneurs across South Florida. The entrepreneurs were members of Cohort 1, the inaugural class of The Empower Accelerator, StartUP FIU’s comprehensive, 14-week program to develop scalable traditional and social entrepreneurship ventures. The program provides coaches, skills training, advisors, access to speakers, cutting-edge workspace and a wide range of additional resources to first-time as well as more accomplished entrepreneurs. With his presentation, Dettbarn made an impression and is in continuing talks with a member of the Keiretsu Forum, a global angel investor network at the event. “Our entrepreneurs were given a proven presentation template to make sure they nailed all the initial information investors need to go to the next level,” says Hacker. Nineteen entrepreneurial enterprises were members of StartUP FIU’s Cohort 1, ranging from beekeeping and honey business to a virtual reality system for the physical therapy industry. The Empower Accelerator curriculum takes the entrepreneurs through a comprehensive and in-depth analysis and development of their entrepreneurial idea. The first four weeks of the curriculum deal with proof of concept, problem and customer value. Weeks five through seven help entrepreneurs define their competitive advantage, solution and customer value (CVP). During the final six weeks, entrepreneurs delve into refining their business model and their financial model and learn to pitch to investors. Leon says the in-depth program prepared his team for Pitch Day. “Engineers and developers don’t make the best public speakers, but somehow we learned how to present ourselves and our idea well,” Leon says. At Pitch Day, following the presentations and the question-and-answer periods, the entrepreneurs got a chance to interact socially with the investors. Twenty-two companies have been selected to for the second cohort of The Empower Accelerator program which starts Januarys 31st, 2017. For more information on StartUP FIU and their accelerators and incubators, Visit startup.fiu.edu. https://startup.fiu.edu/wp-content/uploads/2017/01/Vantage-Points-1.png 500 1000 startupadmin https://startup.fiu.edu/wp-content/uploads/2019/01/StartUp-FIU-hrz-Color-rev-ctr_-300x65.png startupadmin2017-01-30 20:37:152017-02-15 21:39:37Entrepreneurs hit the mark with potential investors at StartUP FIU’s first Pitch Day.